Sundar Kodiyalam, a co-founder of Vatera Healthcare Partners, helps manage our investments while sharing his insights and guidance with our portfolio companies and team. Sundar has nearly 20 years of operating experience in the biotechnology and biopharmaceutical sectors with an emphasis on therapeutic products and over 10 years of healthcare investing experience. His deep knowledge of the industry, ability to drive results and extensive network have enabled him to effectively partner with our management teams and serve as an invaluable resource as they grow their businesses. Sundar currently serves or has previously served on the Boards of the following companies: Pearl Therapeutics, Ascio Pharmaceuticals, Edgemont Pharmaceuticals, Melinta Therapeutics and ImmusanT. 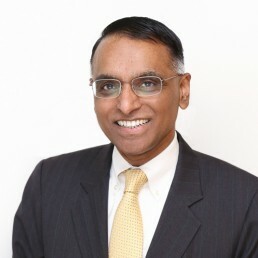 Before joining the firm in 2007, Sundar was Senior Vice President of Commercial Development & New Business Ventures at Kos Pharmaceuticals, Inc. Sundar was a key member of the management team that worked on the sale of Kos Pharmaceuticals to Abbott Laboratories. Prior to Kos Pharmaceuticals, Sundar was Vice President of Commercial Development at Ortec International. Sundar’s experience at large pharmaceutical companies includes 3 years at Schering-Plough Corporation as Director of Business Development & Licensing and 10 years at Novartis Pharmaceuticals Corporation in domestic and international marketing roles. Sundar holds a B Pharm in Pharmacy from Madras University in India and an MS in Pharmaceutical Administration from Ohio State University.